Nicole Harrington: My biggest inspiration is my Dad; he is a licenced plumber and a plumbing trainer for students of all ages. Dad knows so much about every trade and is qualified to do most of them; he is such a hard worker and always driven to learn more about anything. I am inspired by him as he has gone through many ups and downs but through it all he has still come out in one piece. Most of his trades are in three countries (South Africa, New Zealand and Australia) which I think is amazing because he had to qualify again and again in each country and in each country adding more and more to the list. His perseverance and motivation is something that not many people have and I look up to him because of it. Although he is a very difficult man on some days (being my Dad), he is full of knowledge and wants me to be a good plumber and I appreciate that he doesn't let me have it easy because it has made me the person I am and I know I will never be a 'Plastic Plumber" like some of the female plumbers are. Something else that inspired my career in plumbing is exploring and learning more about the opportunities that a plumbing qualification can lead to. 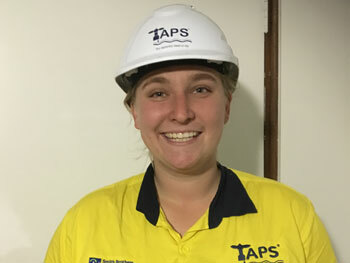 I have worked with Carli Lowe, a plumbing inspector from Brisbane City Council, who guided me through a part of my apprenticeship, showing me the amazing opportunities that females have in this country and in the trade. She is very serious about her job and very talented. Throughout my apprenticeship, I have met many female tradies through events and working on site with some, all of which have taught me different parts of the trade. These ladies enlightened and inspired me about the situations they have gone through on site and the struggles they have faced and how to overcome them when doing a trade in a male dominated industry. I think something that I didn't think would inspire me the way that it has is knowing the amazing difference that plumbers make in the world. It is a job but I think it is also a privilege to keep people safe and prevent many sicknesses and even death. I believe when plumbers do the work they are qualified to do, they provide a safe and functional way to source and use water that is safe to drink or use, being able to rid of waste safely and efficiently and giving normal people comfort and an ease of mind in their homes to use the toilet or shower. Some countries in the world don't have these options and coming from a country that has a lot of poverty, it is something very close to my heart. This is something that I don't think many people see or know about the plumbing trade and for me it is an essential part of my motivation and determination. 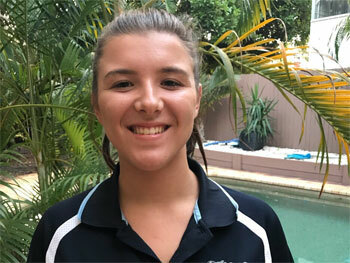 Nicole Harrington: I have been plumbing with my Dad since I was very young (around 5/6 ), hanging on scaffolds, cleaning tradies' vans for pocket money and spending my school holidays on a worksite. My apprenticeship officially started two months after I left school when I worked for a female plumbing company for a year. At the start it was an amazing opportunity for me and was a good kick start to my apprenticeship. I had a lot of exposure working on big commercial sites, working at the Princess Alexandra Hospital and service stations, but it did not work out at the end and it wasn't the right fit for me and my apprenticeship was not progressing the way I would have liked. Now, I work for my Dad's plumbing company with a great team around me and I have great exposure to work as well as getting my theory done throughout the time. Nicole Harrington: I got the call after a difficult few weeks and when they told me I was so shocked. I had been praying for this opportunity since the day that the applications opened and I feel so privileged and blessed to be one of the few to get this award. It is something that I am proud of and I know my family and friends who know how hard I work are proud of me too. I also felt very relieved to know that some of my financial stresses could be eased with the award money I have received and I am so grateful for Rheem to give this to me. Nicole Harrington: The reason I love plumbing is because every day is different. An average day would start with having a coffee with my Dad, discussing the day's work that we would be doing. Then, we would prepare and plan any materials or jobs that need to be done and I always make a list (because I forget sometimes (most times)) and all the little but important things that need to be done: from calling clients to doing quotes and invoices to purchasing materials; the list goes on. Then the team would get together at the office or meet on site depending on the job and we tackle the job at hand. Some of these jobs might include clearing a drain with our high pressure water jetter, doing a new sites drainage and water, council inspections, changing tap washers, beautiful new bathroom renovations, etc. Some days are short and we can finish early but some days we would all tackle the job so that we could finish and get it done which means working overtime and late nights. The day would then finish with a cold beer in the hand and summing up the day with the team. Some days are just a bad day, that's all it is. And you need to have a bad day to know when you have a good day. It's up to you to remind yourself on the bad days of the good days, and that's just the way it is to be a tradie. Nicole Harrington: I can't say that I have already overcome the challenge because sadly I don't think it is something that will change in the near future. It seems that a big part of the world has this idea that women can't do what men can, and I believe this to an extent, but I think a woman is brave enough to attempt this challenge they actually can go much further than they think. always feeling left out because you're not part of the 'boys crew"
I think that it takes someone who is strong in all ways and determined to be a plumber. Not to prove it to anyone except yourself, to prove to yourself that all the negative and degrading things they have to say about you are not actually true. That you can. I believe it is such a beautiful thing how strong you can become when surrounded by people who challenge you the way we as women in trades get challenged and tested. If you look at yourself and believe in yourself, then I believe that we can do it. It is a mindset you have to have and it's not easy. It's actually really, really hard - it takes a lot of patience (which I don't always have), a good support network and a lot of prayers. At the end of the day, when you get thrown in between the wolves, I believe you should come out leading the pack. Nicole Harrington: My career goals have many branches as the plumbing trade has such a diverse range of opportunities available. I have a few different ideas which include Plumbing Inspector, Plumbing Trainer or even Project Management – they're the big goals. Although these are all up for debate as I'm still gaining experience and seeing where my strengths and weaknesses lies. Plumbing is now becoming a sought after career for young female apprentices too.